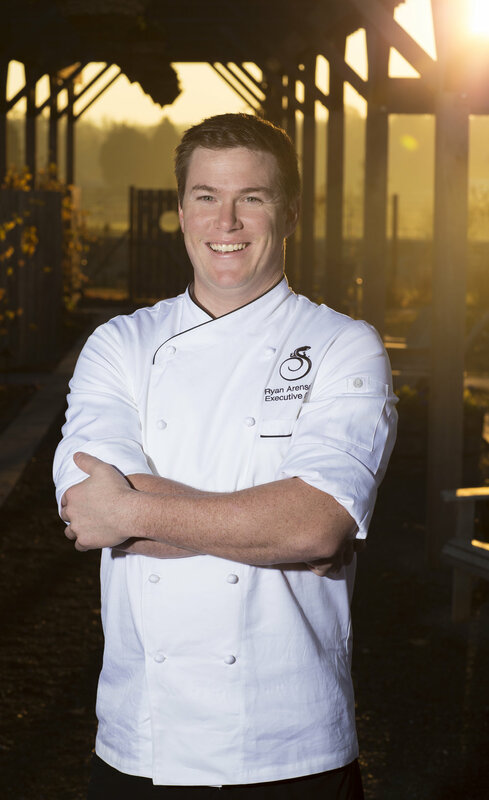 Chef Ryan Arensdorf of Harriman’s at the Salamander Resort & Spa loves to serve up hot buttermilk biscuits to showcase the best of seasonal jams and spreads, and of course the honey made on property by Salamander’s own bees. Finish these off with a drizzle of your local honey and make a big batch, they also freeze well. Who doesn’t love a hot biscuit with honey? Preheat oven to 370 degrees. Pulse the dry ingredients and the cold butter in a food processor until the butter is comparable in size to peas. Transfer to a medium sized bowl and form a well in the center. Put the buttermilk in the well and slowly mix with the flour mixture with a fork. Just when the mix starts to come together start to use your hands to work the dough. When the dough has come together enough to not fall apart you are finished, don’t overwork the dough to get a fluffy muffin. Place the dough between two layers of parchment paper and lightly roll out to just over 1 inch thick. Using a 2.5-3” cookie cutter, stamp out your biscuits, saving the leftover dough. Gently take the left over dough and knead it back together. Repeat the process above. Place the biscuits on a baking pan lined with parchment paper and refrigerate at least 30 minutes. Baking straight from the refrigerator for the best results. Bake for 15-20 minutes or until cooked through and golden brown. Brush immediately with melted butter and drizzle with local honey. Let rest 5 minutes. Serve.